Thanks to rob! for this gem of a screencap, from one of the "Lost Episodes" of Superfriends. Hawkman looks great, right in line with this Super Powers toy. But what in the high holy heck is going on with Shayera's costume? Even if you didn't have the right color reference for the character, why would you go so left field from the colors of her partner whom she shares a superhero name with?! Did they think it was like Batman and Robin, where the colors are so wildly different. Furthermore, it's not even a good look; if the color scheme was better, at least it would be tolerable. Image: Superfriends Hawkman and Hawkgirl, image obtained from The Aquaman Shrine. Is there any Hawk-related stuff we can expect to see at the local comic shops today? Let's find out! JLA/The 99 #1 -- Hawkman seems to play a pretty big role in this crossover, if his appearance on the covers and name-drops in the solicits are any indication. I like the idea of international heroes, but being a Red Stater and all I have my concerns as to where exactly this book's head is going to be at. In any event I'll wait and check it out in collected form. Straight from The Source, check out this variant cover for Brightest Day #13 from David Finch. Seems like this one should have showed up earlier in the series, but it's still pretty sweet! 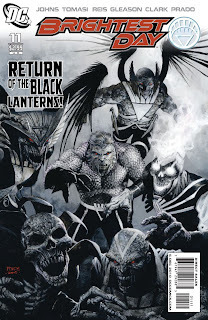 Image: Brightest Day #13 variant cover, 2010, David Finch. Sorry for the lame post today (and missing yesterday)... not sure what happened to me, but I guess I got preoccupied. So, to make up for it, please enjoy this image of the Hawks from Zero Hour. I may not have quality, but I have quantity! All new 2-packs of best-selling, previously-released DCUC figures available only at Walmart! Just like all other previous 2-packs, these packs contain figures and accessories only, not the Collect and Connect™ figure parts. Packs include Gentleman Ghost/Hawkgirl, and Superman/Parasite. Considering that I have never seen Hawkgirl nor the Gentleman Ghost in person, and both command fairly large prices on eBay (much more than I am going to pay for an action figure), this two-pack is like from toy heaven. It doesn't even look like they have been repainted either, just repackaged. The name makes me smile as well -- "Fates Intertwined," indeed, if you remember the Gentleman Ghost story from early in Volume 4. For what it's worth, I am really tempted by the Superman/Parasite set as well. Parasite is a great mid-card Superfoe, and I don't have a modern Superman toy. I will definitely be keeping my eyes peeled for these two in the coming weeks! 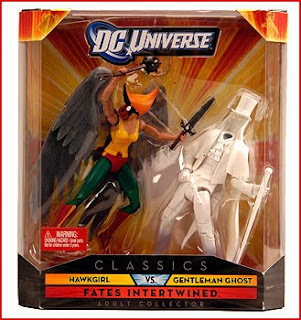 Image: Walmart Exclusive DCUC "Fates Intertwined" set, 2010, image retrieved from Toy News International. What kind of Hawk-related comics and stuff can we expect to see at the local comic shops this week? Let's take a look and find out. Brightest Day #12 -- We have been getting a whole lot of Firestorm and Aquaman lately in this series, and considering the cliffhanger of the previous issue I think we are going to get more of them. Which is alright, because I like those storylines. 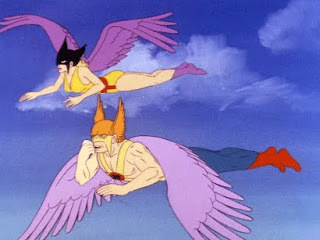 Still, I would like to see a Hawkman and Hawkgirl look-in if nothing else. Plus we got the return of the Black Lanterns, which raises all sorts of questions. 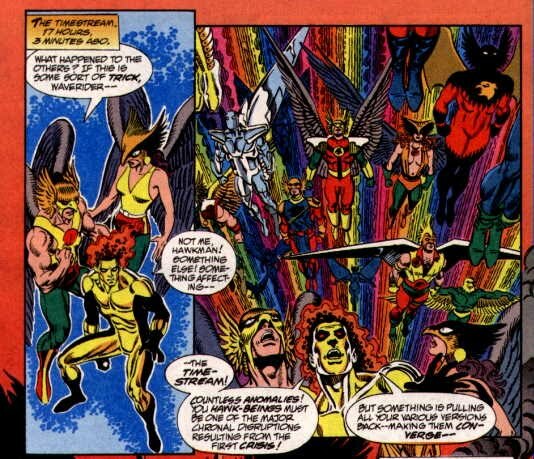 Justice League of America: When Worlds Collide -- This JLA story not only features both Hawkman and Hawkgirl in pretty large roles, but also features longtime Hawkfoe Shadow-Thief as well. Beyond that, I like the Milestone characters and this price is certainly right (especially compared to the HC). Title: "The Treasure Of The Hawk-God's Tomb!" That night, as Carter Hall makes his way through the auction, the bidding is set to begin on the Tomb. Suddenly "Hall" tears off his disguise and is revealed to be Batman! A brawl breaks out, and the guests who pour out are promptly arrested. Before Batman can get his hands on Lamont, he fades away and escapes. Commissioner Gordon compliments Batman on recovering the Tomb, but Bats reveals it to be a fake. In a store room in the Gotham City Museum, Lamont appears, ready to steal the real Tomb... only to have Hawkman pop out of it! The Winged Wonder is able to subdue the Fadeaway Man and recover the Tomb. The heroes had deduced that Lamont was hiding the Tomb in plain sight and planned to steal it for his own collection. The case closed, Hawkman and Batman congratulate each other on a job well done. Review: Pretty standard team-up which serves more as a showcase for the Fadeaway Man... who would not reappear for almost twenty years. *sigh* Be that as it may, it's a nice little adventure. The main attraction for me is the awesome Jim Aparo artwork. 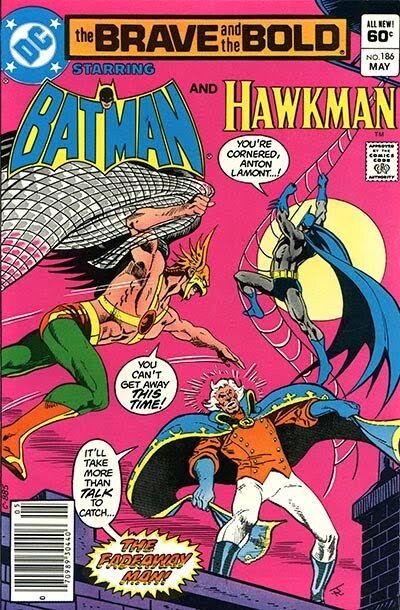 Aparo's Batman is, always a thing of beauty, but we don't see his Hawkman as much, so it's a real treat. Penguin also has a cameo at the auction, a nice touch. All in all a pretty good little team-up but nothing to go crazy trying to find. Note: This issue also has a Nemesis backup story by Cary Burkett and Dan Spiegle. Image: The Brave And The Bold #186, 1982, Jim Aparo. I don't know much about this card, other than it was released in Argentina in a series of other superhero cards and packed with gum (of course). The combination of the all white eyes and the silly grin gives this rendition of the Winged Wonder a certain sense of goofiness, don't you think? Like he and Shiera are out for a Sunday fly rather than looking for some criminals brains to bash in? Maybe planning what they are going to do for next year's Impossible Day. Image: Agrentinian Hawkman gumcard, ??? ?, image obtained from eBay. Any new Hawkman or Hawkgirl stuff in stores this week? Let's look and see! Spotlighting Hawkman and Deadman – two of the characters who returned after BLACKEST NIGHT to usher in BRIGHTEST DAY to the DC Universe! This volume collects several hard-to-find stories including tales from HAWKMAN #27, 34 and 36, SOLO #8, DCU HOLIDAY '09 and STRANGE ADVENTURES #205. Everything from the first appearance of Deadman to a team-up between he and Hawkman can be found here! The three issues of Hawkman are all from Volume 4 (there was never an issue 34 or 36 for any other volume! ), and are all standalone. Of particular interest is that none of them have ever been collected before, and it is unlikely that they will be. The Volume 4 trades jump from the Headhunter story at the end of the third collection (v.4:no.25) to the Golden Eagle story (v.4:no.37). So I am probably going to pick this up just to fill in 34 and 36, both of which I need. Title: "The Thanagarian, Part 3"
Summary: In St. Roch, during the Jazz Festival, the merriment is interrupted by a brawl between Hawkwoman, Animal Man, and the Thanagarian criminal Byth. The heroes hold their own, as Byth rants about going back to Thanagar to restart the drug trade between the two worlds. 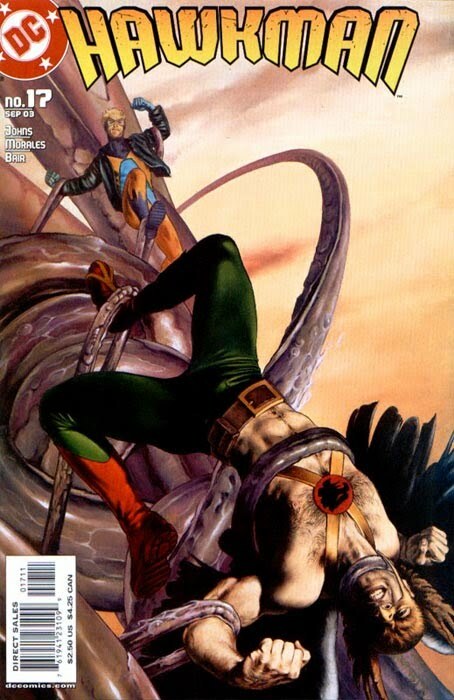 Eventually, Animal Man is downed, and Byth captures Hawkwoman and gets away. Hawkman and Hawkgirl find Animal Man, having deduced that "Katar" was Byth when his mace came alive and attacked them. They make their way to the Hawk Hangar on the outskirts of the parish, and find that Byth has stolen their ship, the Brontadon, and is using Shayera as a navigator. The Hawks and Animal Man intervene, and after Shayera sabotages the ship, Hawkman crashes through the wall to attack the criminal. As Hawkgirl and Animal Man keep the ship flying, Hawkman and Hawkwoman battle Byth, who transforms into a Thanagarian dragon-like monster. 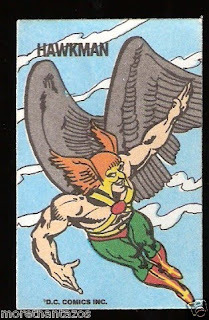 His threat is short-lived, though, as Hawkgirl and Animal Man crash the ship into him! With Byth imprisoned, Shayera is heading back home. She says her good-byes to the Earther Hawks, giving Kendra one of her old wing harnesses, which is armed with shuriken. On the ship, Shayera vows to be reunited with the real Katar Hol someday. Review: The wrap-up is action packed, as you can imagine. We get two long fight sequences strung together with some dialogue, and then the denouement. I don't mind though, because Byth is a classic baddie, and seeing Hawkwoman and Animal take the spotlight was a nice change of pace. Speaking of classic, Byth does indeed transform into the same creature he did way back in 1961's The Brave And The Bold #34. A satisfyingly smash-heavy conclusion to the story. Image: Hawkman v.4:no.17, 2003, John Watson. James Robinson To Write Hawkman? [James] Robinson just let slip he'll be doing something with Hawkman because Sattler told him Dan DiDio told everyone last night. He didn't. Well, Robinson's faux pas is our gain! If he is doing something with Hawkman I assume it is going to be in Justice League of America, which is his playground these days. Which makes sense considering the historical connection with the League. I am assuming (speculating, really) that anything Robinson does with Hawkman will be after Brightest Day wraps. But it's anyone's guess, really! Summary: In Egypt, Daily Planet reporter Lois Lane arrives on an archeological dig, and is greeted by the site's chief, Carter Hall. Carter and Lois get to talking about Clark, and his secret, and Carter begins to tell her about the need a hero has for a partner. He tells her about his and Chayera's curse, and how they are destined to meet and fall in love, only to die over and over. Carter then gives Lois a book containing the story of Khufu and Chayera, and while telling her about it, gets misty-eyes, imagining Lois to be his reincarnated love. When he kisses her, however, he gets a slap for his effort. The next day, Lois says that she didn't realize the book was an autobiography. Carter apologizes for the night before and says that he realizes that he soon will move on from this life. Later, Carter washes his face with water brought in by a local woman, and his mysteriously marked with the logo of the Suicide Squad. Review: A nice surprise of a subplot, although when Lois ended up in North Africa at the end of the previous episode I figured there was a chance of a Hawk appearance. I laughed when Lois called Carter a "real Indiana Jones," considering that is often cited as one of the benefits of this Generation of the character. Shanks' portrayal of Carter is still spot on, and even though he ended up kissing Lois at least he didn't fall for her like every other hero seems to do on this show. The cameo by Chayera/Shiera was nice too, although I hope we get more of her in the future, including in costume. You can check out a pic of Michael Shanks as Carter Hall over at Kryptonsite. 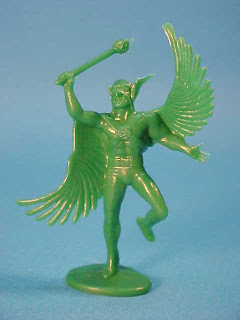 Back in October of 2009, I was at the Greenville Comic-Con when I found a little green plastic "Army Man" style Hawkman. I said at the time that a picture would be forthcoming... so a guess a year late isn't too bad, right? Pretty neat little chunk of plastic. He stands on one of my toy shelves, right in front. Anyone else have other heroes in this style? 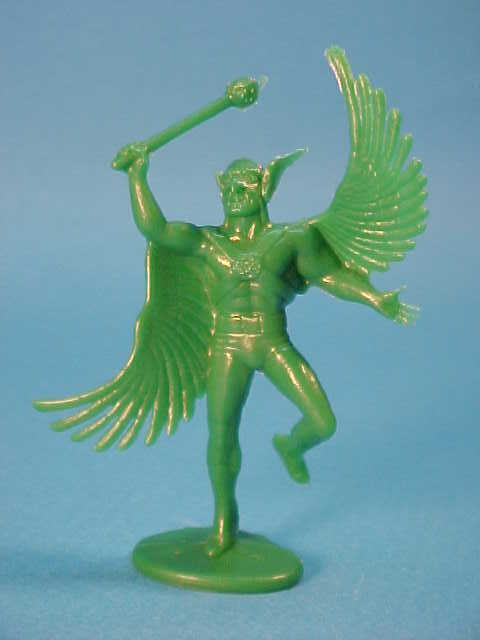 Image: Hawkman "Army Man" toy, 1981. It's Wednesday in America, which means new comics and the potential for new Hawk-related stuff! Brightest Day #11 -- The preview suggests that this will be more of Aquaman and Firestorm, but I imagine we will get at least a check-in with Hawkman and Hawkgirl from Hawkworld. (Wow, try saying that three times fast.) Hard to believe that we are rapidly approaching the halfway point on this series. I expect that some big twists are coming, although to be fair, there have been a large number of them already. From DC's The Source, here is a preview of Brightest Day #11, promising some big goings-on! And a double-page spread that will make your jaw drop. Twice. All courtesy of writers Geoff Johns and Peter Tomasi and the all star artistic team of Reis, Gleason, Clark and Prado. The cover along should induce some folks into picking this book up, I am sure. Although a throwdown between Aquaman and Black Manta should excite any red-blooded DC fan! Doesn't seem like we will get much in the way of the Hawks this time out, but maybe we'll get a "look in' or something to tide us over. Brightest Day #11 hits this Wednesday. Image: Brightest Day #11, 2010, David Finch. Hawkman Sketch by "Kid Benicia"
Today's sketch comes from "Kid Benicia" from the Comic Geek Speak boards. This was done for me as part of the "June Birthday Sketch Thread," where anyone with a June birthday could request a sketch. All in all a nice little piece. I like the dynamic motion, and the less is more approach to the torso and chest. And you know I like art where Hawkman is wielding his mace! Image: Hawkman sketch, 2010, "Kid Benicia", retrieved from The Comic Forums.